Regiment/Catrawd: 16th Battalion, Canadian Infantry. Service Rank and Number / Rheng gwasanaeth a rhif: Sergeant No. 51260. Ref No Grave or Memorial / Rhif cyfeirnod bedd: Panel 24-26-28-30. Killed in action in the trenches at St. Julien, Ypres, Belgium on Monday 19 April, 1915 aged 38 years. Algernon Venables Plunkett was born in Dublin, Ireland on 10 November 1876. His parents were Merrick Shawe Plunkett, a Landowner. His mother Caroline Mary Plunkett (nee Penson). They lived at Gwersyllt Hill, Denbighshire, North Wales. Algernon was educated at a Boarding School, namely. Lloran House, Oswestry, Shropshire. During late March 1897 he left Liverpool, England on board SS Eturia, bound for New York, USA, arriving there on 12 April 1897. On 28 March 1901 he married Bertha Joslen. On Tuesday 9 February 1915, Algernon who was now 38 years of age enlisted with the 16th Battalion, Canadian Infantry. His Attestation Papers – Canadian Overseas Expeditionary Force states that he was born in Dublin, Ireland on 10 November 1876. His occupation was recorded as a Barrister. He was described as 6′ 3″ tall, fair complexion, blue eyes, fair hair, chest measurement 39″, with an expansion of 2.5″. On examination by the Army Medical Officer he was passed fit for military service. He was killed in action in the trenches at St. Julien, Ypres, Belgium. 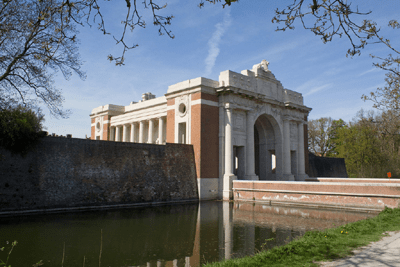 His burial was never found and he is commemorated on the Menin Gate Memorial. There is no Flintshire Roll of Honour Card for Algernon Vernon Plunkett at the County Archives Office, Hawarden, Flintshire. 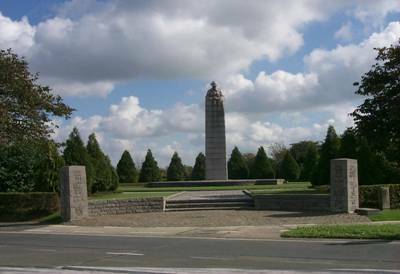 Canadian Memorial at St. Julien.